Neonatal isoerythrolysis (NI) – also known as jaundice foal syndrome and hemolytic disease of the newborn – is caused by an incompatibility of blood types between a mare and her foal. Breeding a foal is usually a relatively smooth process – but when things go wrong, they can go really wrong. While relatively rare, the disease Neonatal isoerythrolysis – or jaundice foal syndrome – can be a killer for foals, writes Dr Kathryn Graves. 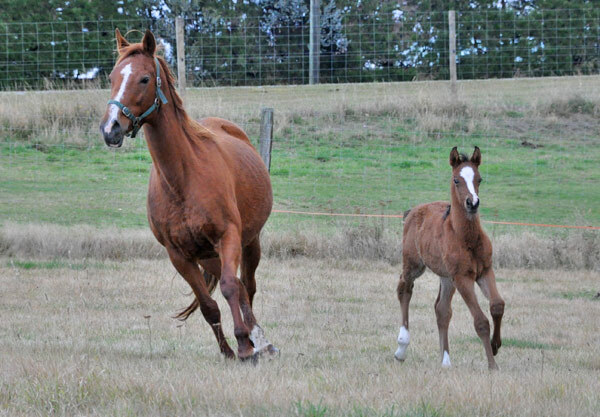 Neonatal isoerythrolysis (NI) – hemolytic disease of the newborn – is caused by an incompatibility of blood types between a mare and her foal. If a foal inherits from its sire a red cell factor (antigen) that the mare lacks, the mare may develop antibodies to that antigen. There is no harm to the foal in utero, as there is no commingling of the mare’s blood with that of the fetus. However, these antibodies will be present in the mare’s colostrum and will be ingested by the newborn foal. Following transfer across the foal’s intestinal mucosa and entry into its bloodstream, the antibodies will attach to the foal’s red blood cells and cause their destruction, resulting in a jaundiced foal and in severe cases, death, unless quickly diagnosed and treated. How mares become sensitized to red cell antigens they don’t possess is a mystery. How mares become sensitized to red cell antigens they don’t possess is a mystery, but transplacental hemorrhage or exposure to the foal’s red cells during parturition have been suggested as possible mechanisms. A mare’s first foal is seldom affected, but subsequent foals carrying the offending antigen will be at risk. Horses have complicated blood types, consisting of 30 or more factors (antigens) that are grouped into systems (A, C, D, K, P, Q, and U). Factors within each system are designated with small letters. The factors most commonly associated with NI are Aa and Qa. Mares that are negative for these factors are the ones most at risk for developing anti-red cell antibodies. About 19% of Thoroughbred mares are negative for the Aa or Qa antigens, and 17% of Standardbred mares are negative for Aa (Qa being extremely rare in Standardbreds). The relative frequency of these antigens in a breed determines the risk of a mating producing an NI foal. For example, only 3% of Thoroughbred mares might be negative for Aa, but since most Thoroughbred stallions are positive for Aa, the risk is greater that an incompatibility will occur. Some practitioners believe that any positive result for NI, regardless of strength or specificity, is sufficient cause to withhold the foal from nursing. Managing mares that are at risk for producing an NI foal consists of screening these mares for anti-red cell antibodies within the last 30 days of pregnancy or after udder development has begun. Sera from mares are tested against a panel of known blood types to determine the specificity and concentration of any antibodies that are present. While it has been standard practice to withhold foals only from mares with a titer of 1:16 or greater, some practitioners believe that any positive result, regardless of strength or specificity, is sufficient cause to withhold the foal from nursing. This is because in some cases, a low pre-partum titer to a red cell antigen may increase significantly just before foaling. If an anti-red cell antibody is found in the mare, the foal should not be allowed to nurse from the dam and should be given banked colostrum; the dam’s colostrum should be stripped out over a 24-hour period before allowing the foal to nurse. In a mare with a history of producing an NI foal, either all subsequent foals should be withheld from nursing the mare for 24 hours, as explained above, or the mare should be bred only to stallions that do not possess the red cell antigen to which she is sensitized. If an anti-red cell antibody is found in the mare, the foal should not be allowed to nurse from the dam and should be given banked colostrum. Since DNA typing has widely replaced blood typing for identification and parentage purposes in the last 15 years, the number of laboratories offering blood typing and antibody screening services has diminished. Some large veterinary clinics offer NI testing and red cell typing for the most common antigens involved in incompatibilities. The University of Kentucky Animal Genetic Testing and Research Laboratory is the last major facility offering full blood typing and screening services. Dr Kathryn Graves is with the Maxwell H. Gluck Equine Research Centre at the University of Kentucky, Lexington. ← Handling a stallion: Have you got what it takes?